Save A Life During Adopt A Shelter Cat Month! Home » Inside Pain » Save A Life During Adopt A Shelter Cat Month! If you’ve been wanting to add a furry member to the family lately but have been putting it off, now’s the time to take that next step. It’s Adopt A Shelter Cat Month, so think about whether a cat is right for you, consider all the benefits that can come with having a cat, and – if it’s the right move for you – head down to your local animal shelter. Cats are good for your health, both mental and physical. Animal lovers are well aware that having a cuddly friend at home can be an immense comfort. In fact, a study at Ohio State University found that college students reported that their animal companions kept them happy, helped them stay active, and kept them from feeling isolated. Other studies have found that the children of families with pets miss less school. Also, for families with bots kids and cats: research has shown that having cats can reduce a child’s risk of developing a painful skin condition called atopic dermatitis. Children raised in a house with two or more pets are also less likely to develop allergies, even to non-pet allergens like ragweed or grass. Other animals can be fantastic pets, but there are plenty of reasons you should bring home a new feline friend during Adopt A Shelter Cat Month. Dogs can be expensive and a lot of work. Cats, though – particularly adult or senior cats – are pretty chill. All they really require is food, water, a warm place to sleep, and maybe a sunny shelf or windowsill to nap on. 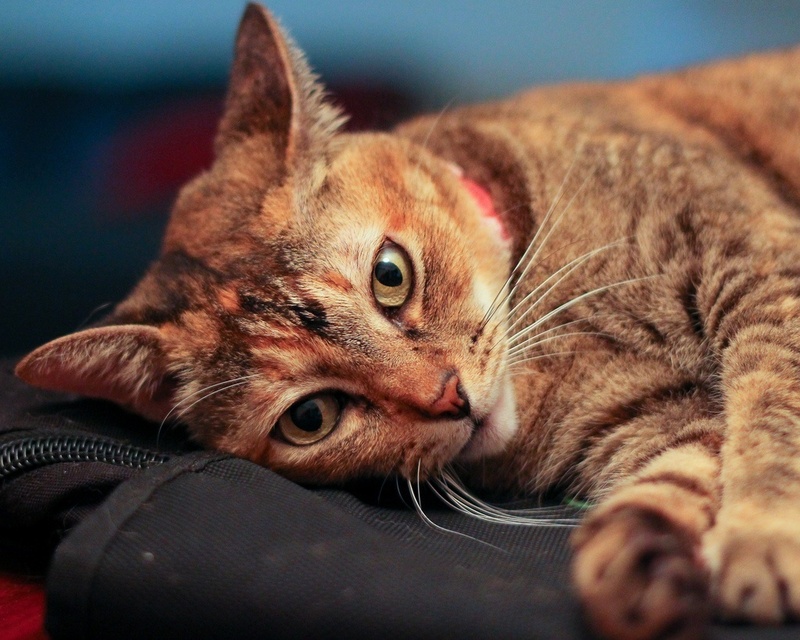 Some cats might be more active or playful than others, but let’s be honest: cats are lazy. Even the most playful cats will sleep for 16 or more hours per day, so they’re almost guaranteed to be less demanding than a dog. Also, hygiene and clean-up for cats is a little easier. Most cats clean themselves and will, at most, need you to brush them occasionally. Litterbox cleaning isn’t exactly fun, but it’s easier than stomping around the yard, bent over with a pooper-scooper. There are even automatic litterboxes, sifting litterboxes, or septic-tank-safe, flushable litter that can make your life a little easier. Consider size when thinking about a pet, too. Lots of dogs are big, and if you’ve got a pain condition, that can be a big problem. Even a small dog, if it’s jumping at your legs or tugging on a leash, can trigger pain. Cats, though, average just under 10 pounds, and they’re probably not going to be bouncing, bumping, tugging, or doing anything else that will trigger a pain response for you. If you’ve got a pain condition, also keep in mind how much work a pet requires. Cats are very self-sufficient. If you’re hospitalized, too sick to get out of bed, or even just go for a well-deserved vacation, all your cat will need is food and water. A neighbor, friend, or family member can easily stop by once a day for a few minutes to keep your cat healthy. Once you’ve decided to get a cat, there are several reasons to get your new friend from a shelter instead of a pet store or friend. One of the biggest reasons: a shelter cat will save you time and money. Shelter cats have been seen by a vet, vaccinated, dewormed, and spayed or neutered. Most shelters even microchip your cat or send home a starter kit with some food, toys, or other goodies. Other shelters might offer a short period of insurance so that, if a health issue crops up after you get your new cat home, you won’t have to pay the whole bill yourself. Depending on your vet’s prices, all of this could cost you a lot of money, but it’s included in the adoption fee for a cat. Another big bonus to adopting from a shelter is the personal connection shelter workers often have with their charges. Get a cat from a pet store, a friend, or a newspaper ad, and you might end up with the perfect companion – or you might end up with a hyperactive, super-social cat that would have been better suited to a young family. Shelter workers, though, know their cats’ personalities. Have a list of traits in mind before you go in, such as calm, affectionate, or independent, and you’re very likely going to end up with a soul mate of your choice. If you’re able to devote yourself to a special needs cat, you can mention that, too. There are many cats with medical or behavioral issues who are amazing pets but just need a little extra TLC. Don’t automatically go with a kitten. Cats, as mentioned, are pretty chill. They’re calm and, when the mood strikes, very cuddly. They’re all-around low-maintenance and low-stress. However, there is a big exception to this rule: kittens. Kittens are adorable and hilarious, and there’s definitely something to be said for having a cat from kittenhood through adulthood. But kittens are hyper, extremely curious, and can be destructive and frustrating. If you’re willing to put up with a few months of high-maintenance kittenhood, great. If you’d rather skip right to the calm cat, go for an adult or senior. These cats can be just as fantastic as pets, and you can develop just as deep a bond with them. Another bonus: the adoption fee for adults and seniors is usually less than the fee for kittens. If you’ve got an active adult, or if you decide to go with a kitten, consider getting two cats. The shelter workers will be able to steer you toward two cats who will get along well, and then your new feline friends can play together and wear each other out. To find a shelter near you and bring home a new friend for Adopt A Shelter Cat Month, check out these websites. Are you going to bring home a new family member during Adopt A Shelter Cat Month?